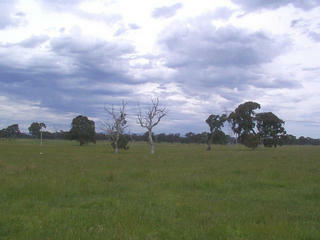 17-Nov-2001 -- NE of Maindample, Victoria. Having already nailed four confluence points today, this last attempt for the day should be quite easy as I’ve actually visited it before. I decided to make it even easier for myself this time by utilising the SEC (State Electricity Commission) access gates to drive right under the power lines to get within just a couple of hundred metres of the confluence point by car. It isn’t a particularly interesting confluence, but it does hold some significance to me as it was the first confluence point I ever visited. When I first visited this place, I had a really bad camera and none of the pictures came out particularly well, which probably explains why the visit never made it beyond “pending” status on the www.confluence.org website. One thing that was quite interesting is how much “greener” the pastures are in this part of Victoria compared to the north-west of Victoria that I toured a month ago (35°S 142°E, 35°S 143°E, 36°S 143°E and 36°S 144°E) and the farmland I saw earlier today in the Riverina region of Southern New South Wales (35°S 144°E, 35°S 145°E and 35°S 146°E). I’ve done a nice panorama this time so hopefully this visit will get a guernsey. So that was the fifth and last attempt for the day. We all had lots of fun and will sleep well tonight!